Bat signal goes up and we belt through the hub and out into the chilly car park to find the Batmobile -- erm, Bluemotion VW -- and fire her up. Vroom. Where to, Boy Wonder? Hold up, let's consult our ToDo Google Map. That one'll do. Engage thrusters over Orwell Bridge, off on the A137, Jimmy's nought but a blur, then left on the B1080. Closest we've been to here previously was Popins at Holbrook, over there. 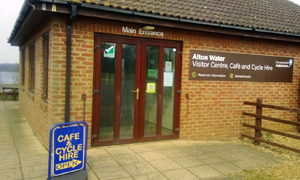 Pop £3 into the machine and you're good to park by the visitor centre of Alton Water, "the largest area of inland water in Suffolk", oh yes, and scene of one of my (least) finest hours. That was years ago. Moving on, we're mighty lucky the cafe (next to the bike hire) is open today: they'd be shut on a Monday if it wasn't the Easter hols. Whiteboard offers sarnies, jackets and drinks. Bacon sandwiches all round, please, his on white, mine on brown with a banana Yazoo on the side. Interior is functional and caff-like with some aging information boards. Lady brings over our grub which is similarly uninspired, couple of slices of microwaved bacon with not a hint of garnish. Nothing to cause the owners of the Wild Strawberry any sleepless nights, that's for sure. If I had a postcard, I wouldn't be mentioning my food for the right reasons: £3.50 for this?! At least there's a goodly selection of choccy bars -- enough Wagon Wheels to fill a Kwik Fit -- plus two or three proper cakes, even something gluten free. Filter coffee was no better than OK, though at least they offered real milk rather than UHT yuckiness, but my lump of fruit cake was by far the best thing there. Funny that last time I was here (midway through a freezing cold New Year's Day bike ride), this place seemed warm and welcoming. Today, it's brought to you by the words ho and hum. If it was a car -- Ford GPA.